$1,299.99 & FREE Shipping on orders over $59. A countertop brewing appliance that produces 2.5 gallons of amazing beer. The Braumeister is a semi-automated process where you add the grain and water at the beginning of the brewing process, set your controls and walk away. You're alerted to remove the grain before the boil and later to add hops. Simple. One nice advantage versus the Pico Brew is the Braumeister reaches and maintains a true boil, a key factor in final beer quality. 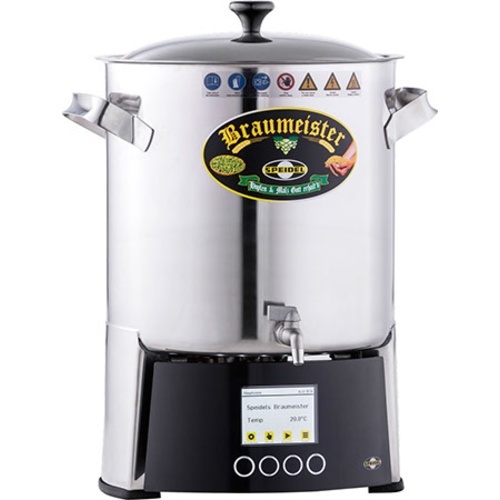 This little Braumeister has some much larger big brothers (up to 500L/132 gallons) used in commercial brewing. The exact same controller and technology is used on this 10L version. 2015 has brought an update to the user interface on these units. The new control panel showcases a large LED screen, allowing for easier recipe viewing and manipulation, as well as a memory bank to actually store recipes for future brews. Speidel has also been planning for the future with these new control panels. Aside from immediate benefits, there is hardware to support WiFi control and other functionality that will be released as software updates to existing units. On Brew Day you are going to assemble your Braumeister with the mash tub and bottom screen. You will fill the unit with filtered water to a notch on the center post - easy. The controller reads in C, and you can set it to different temperatures you wish to reach. Advice is given in the manual. When your water is the correct temperature a beep alerts you to add grain. Stir in your grain, lock down the top screen (so now there is a screen on the bottom and the top) and start the mash. During the mash wort is constantly recirculated through the grain bed from the bottom up, reverse of most typical systems. The liquid wort flows up through the mash and then cascades down between the mash tub and the outer wall of the Braumeister. There it is collected by the pump and pushed back through the mash. When the mash is complete, another beep will alert you to remove the entire Mash Tub, which sets on top of the Braumeister to drain for a period of time. Push another bottom and the boil starts. You program the length of the boil. When the boil stops insert your wort chiller and cool. Braumeisters require a 230v connection and you should plan to have an electrician install a socket and then wire on the appropriate plug. Or you can choose to use a transformer that converts 110v to 220v power such as this one. useful brew day equipment check them out here. My standard batch is 2.5 gallons, and this system is perfect. Pros- automaton level is just about perfect, cleanup is pretty quick and easy since it's not too heavy, repeatability and consistency are perfect, ability to step mash if needed, shorter brew day since smaller batches heat and cool more quickly, with smaller batches you end up getting to brew more, achieves a full on boil, takes up way less storage space than my old system. Cons- metal is a little thinner than the 20L Braumeister so not quite as sturdy, the controller is a little bit out of proportion since it was made for the larger versions, the inside is not polished like the 20L, a few tiny cosmetic issues that didn't affect function, pump could be just a touch stronger but is adequate. Non-Issues- Grain Limit- I very rarely brew north of 6% anyway. 220V- Surprisingly easy to find a cord that goes from 220 on one end to square computer style plug on the other (Amazon). Automation Level- Lets me do the fun parts, but doesn't let me miss temps or forget hop additions. Basically like having your very own assistant/minion. This really does deliver on everything it promises and makes brewing less work and more fun. Extremely happy with the Braumeister 10L. I will never go back to my old system.